This month we had our share of excitement. First we had targets that wouldn't run (something about a humid day, or maybe it was sun spots??). At any rate we managed to finish with 3 of the 5 operational. Still made for a quick competition (relatively speaking), and no one needed to pull targets. In the F-Class arena, two 200-19X strings were posted. John Roethlisberger, and Robert Lorenz were able to nail the nineteen "X" clean. For John it was just a part of a "hall of fame" day by posting a 600-45X. I do not even remember an F-Open shooting posting a 600 at Midland previously (if there was one, contact me, and I will retract this). It is notable that John Pierce finally sold John Roethlisberger the rifle that he had been using. So, John can beat John using his own rifle, instead of using John's rifle to beat John. Who's on first? In the Any Rifle Land, Peter Church and Jake Bondy both nailed a 599-34X. In reviewing the rules for breaking ties, this one appears to be settled with rule: 15.4(c)4, the value of the shots in inverse order. With this Peter wins with a X on his third to last shot, vice Jake's 10. For those of you attending Mid-Range Prone, or Long-Range at Camp Perry, best of luck. For those going to Canada for the F-Class or Fullbore Championships, best of luck, too! Our next match is the Michigan Mid-Range Prone Championship on September 3, 2016 (Day after MSU opens against Furman - who the hell is Furman?). Program for the match is available here. 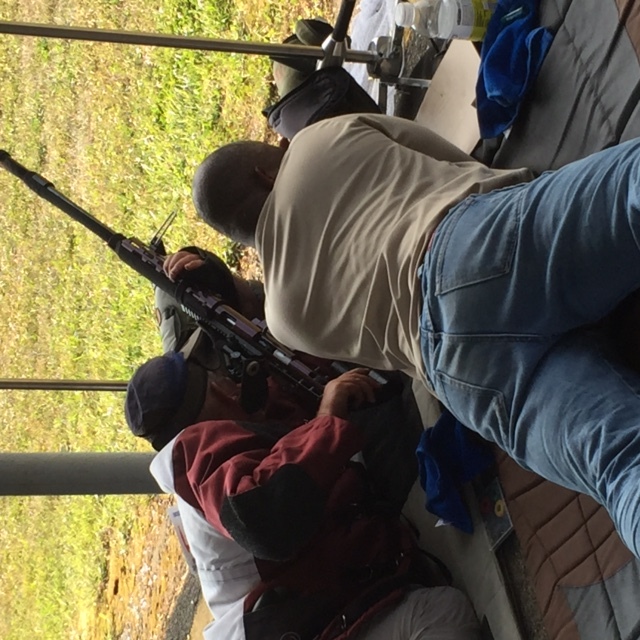 Dan Altman, one of our members, made the cut-off for the 2016 United States Dewar Team during the iron sight phase of the 2016 U.S. National Smallbore Rifle Prone Championship. Dan, shown below firing the match, was coached by another SEMNO Member, Ken Potter. Dan Altman (on left) firing the Dewar Team Match against Great Britain. Ken Potter (on right) is coaching. We have rescheduled the July 16, 2016 Mid-Range Prone League Match to July 30, 2016. This action is being taken to avoid a conflict with the Dale Sunderman Memorial Match at MTC.